Not being in control of your bladder and its function can be an embarrassing situation to find yourself in at any stage of life. Wetting the bed takes an emotional toll on most young kids, no matter how sympathetic you are, they’re likely to still be embarrassed. Particularly if the problem is bad enough to warrant plastic mattress covers or, in extreme cases, diapers. Until four or five years of age, children tend to have difficulty controlling their bladder while sleeping. This is perfectly normal and most parents come to expect it. However, beyond these ages, there may be a physiological problem causing bed wetting. Chiropractic adjustments are not intended to cure or stop bet wetting, but many children have seen improvements after a chiropractic adjustment. It is thought that by alleviating pressure in the lumbar spine the brain has a clearer way to communicate with the bladder, thus improving function. Two muscles in the body regulate when the bladder releases its contents—and when it doesn’t. These muscles are controlled by nerves in the spinal column. In the young stages of a person’s life, the sacrum, a nerve in the lower back, has five distinct parts. As we age, these parts come together and form the triangular-looking shape that most adults have on their lower back. If this area is damaged, it may cause problems with the nerves that regulate the function of the bladder, including control. During a chiropractic examination, the sacrum will be studied to ensure that it isn’t misaligned. However, in the event that it is, it can be adjusted to restore its previous function. 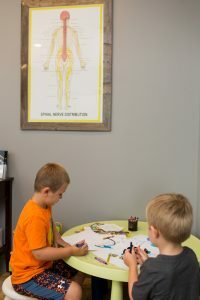 Chiropractic adjustments have been shown to improve the situation of bed wetting for some children, most likely as a result of nervous system complications being resolved. Is it possible that Chiropractic care can treat bed wetting? Chiropractic treatments are not intended to treat bed wetting. However, in all medical cases, a thorough examination of all possibilities may be beneficial. In the event that bed wetting in your child is caused by a nervous system issue, it’s very possible that a chiropractic adjustment may resolve the bed wetting issue.